It's always a pleasant experience dealing with your representatives. It is easy to make changes to my shipping plans at any time. 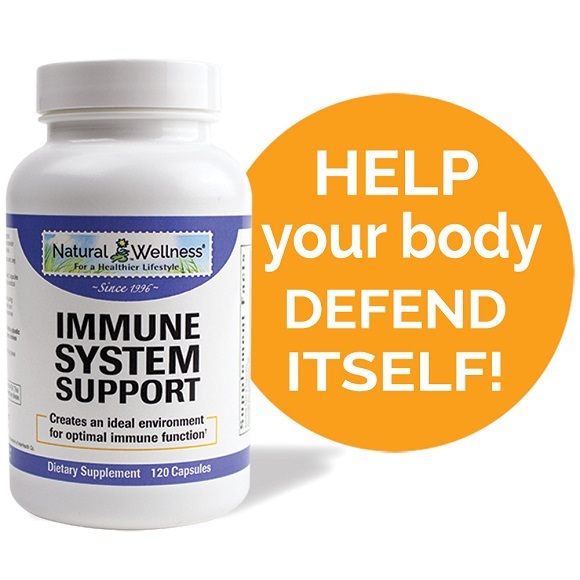 Immune System Support is a comprehensive formula that contains essential vitamins and minerals specifically chosen to protect, support and boost your immune system. This synergistic combination also helps create the ideal environment for optimal immune function within your body. 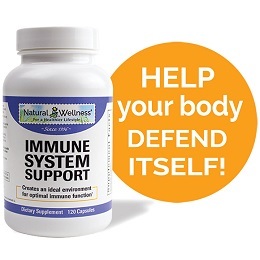 Take Natural Wellness® Immune System Support daily to have your immune system functioning at its optimal levels, even during cold and flu seasons. Natural Wellness® Immune System Support is made with European standardized herbs, which are the most clinically studied botanicals on the market today. Standardized European echinacea extract has been clinically studied since the early 20th century. 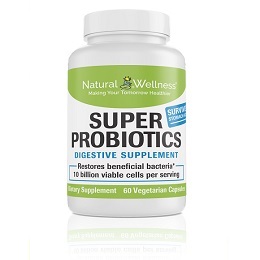 It stimulates the immune system as well as certain immune cells that are critical for maintaining overall health. 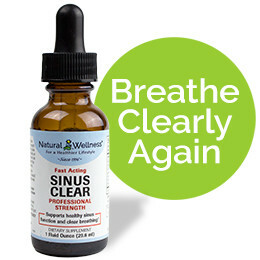 Echinacea helps keep the respiratory system healthy when challenged, particularly during winter months. Echinacea has a long medical tradition with North American Plains Indians and homeopathic doctors in Europe. It has been used to treat general infections and wounds, the cold and flu, strep throat and allergies. 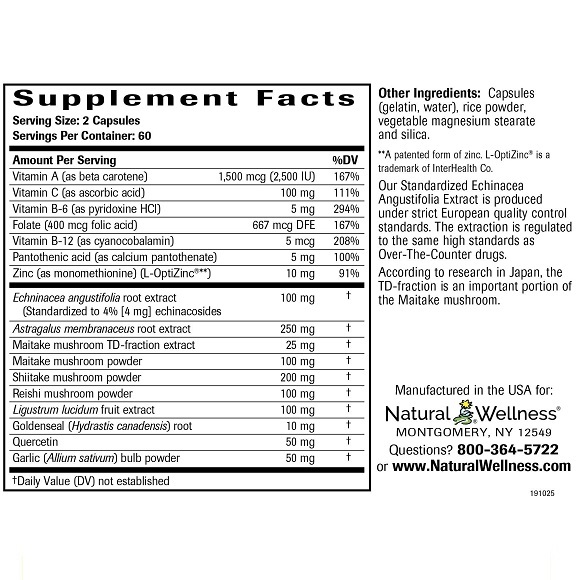 Standardized European astragulus is powerful adaptogenic herb with a remarkable ability to balance and boost immune function. An adaptogenic substance is one that demonstrates an enhancement of the body's ability to resist a stressor. Astragalus has also been proven to help widen or open blood vessels and increase anti-inflammatory actions to help improve blood flow throughout your body. There have been many clinical studies showing how astragalus not only boosts the immune system, but also encourages an increase in immune cell (T-cells, natural killer cells, macrophages, immunoglobulin) activity, production, and function. 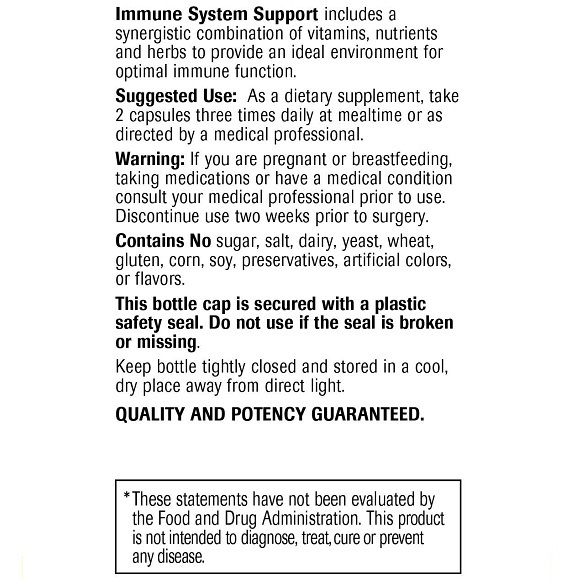 Premium mushroom extracts not found in other immune formulas including, Maitake, Shitake and Reishi Mushroom. 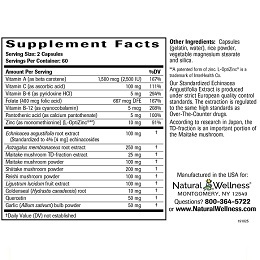 These mushrooms all contain polysaccharide compounds that effectively stimulate important immune cells. Polysaccharides have profound effects in the regulation of immune responses during the progression of infectious diseases. They can influence innate and cell-mediated immunity through interactions with T cells, monocytes, macrophages, and polymorphonuclear lymphocytes. The ability to modulate the immune response in an appropriate way can enhance immune response to certain infections. L-OptiZinc® is the most clinically studied form of zinc available and is the only patented form of methionine-bound zinc. 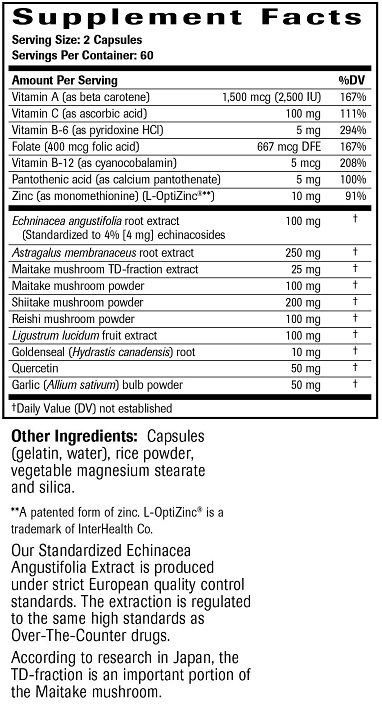 L- OptiZinc is a 1:1 complex of zinc and methionine, the amino acid best absorbed by the body. Studies show that L-OptiZincis absorbed better, retained longer and is more effective than other zinc supplements tested. Zinc is an essential trace mineral required for proper growth and function of many types of immune cells. It is also critical to the health of the thymus gland; the location where immune cells known as T-cells are made. Quercetin is a strong antioxidant and helps provide support for healthy levels of histamine; a chemical involved in cold and allergy-related symptoms. Goldenseal is a native North American herb used by the American Indians as a treatment for irritations and inflammation of the mucous membranes of the respiratory, digestive, and urinary tracts. Because of its anti-microbial activity, goldenseal has a long history of use for use during the winter season and is often used in combination with echinacea. Ligustrum is an immune system boosting herb often combined with atragalus in traditional Chinese Medicine (TCM). Ligustrum is a highly effective but underrated tonic herb with numerous benefits. It has been used to build energy reserves and immunity, reduce stress, strengthen the liver and clean the blood. Ligustrun is also an immune modulator. Instead of just stimulating your immune system, it works to make it function more efficiently and effectively. If your immune system needs to calm down then ligustrum will calm it down. If instead your immune system needs to ramp up, then it will help it ramp up. Vitamin A is the defensive line of the immune system. Vitamin A keeps viruses, infections and other germs from getting into our bodies. Vitamin A keeps mucous membranes which line the throat, nose, mouth and other parts of the body, soft and moist. When these membranes are kept soft and moist they are better able to trap germs, stopping their infiltration. Furthermore, vitamin A helps to boost the immune system by making enzymes that look for and kill germs that manage to get inside the body. Vitamin C boosts the immune system by boosting the cells that are responsible for killing germs in the body. Vitamin C makes interferon, a protein that helps destroy viruses in the body. Vitamin C also increases the level of glutathione, which boosts the immune system. B-vitamins are energy-boosting vitamins that also boost the immune system. 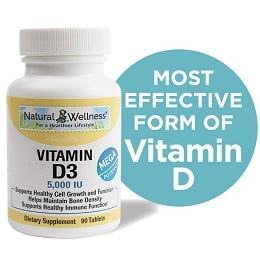 Vitamins such as folic acid, B6 and B12 do a lot to strengthen and boost the immune system. Vitamin B6 especially, has been shown in studies to boost the immune system by increasing white blood cell count in the body. The Department of Nutrition and Food management at Oregon State University conducted a study and found that when women increased their B6 intake from 1.5 milligrams to 2.1 milligrams, their white blood cell count increased by 35%. Pantothenic Acid, another B vitamin, works to decrease stress and helps to create antibodies, which are proteins in the immune system that fight bacteria and viruses. Stress often weakens our immune system and makes us vulnerable to illness. However, pantothenic acid enhances the immune system and regulates stress-related hormones to ensure a healthy state of mind. The production of more antibodies also aid in healing. Wounds recover faster and bacterial infections become less likely. Garlic is a powerful immune booster that stimulates the multiplication of infection-fighting white cells, boosts natural killer cell activity, and increases the efficiency of antibody production. 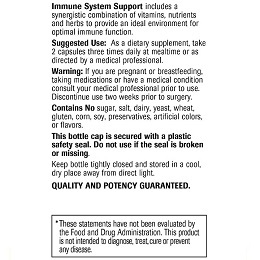 As a dietary supplement, take 2 capsules three times daily with a meal or as directed by a medical professional. Please consult with a medical professional prior to use especially if you have or suspect you might have a medical condition, are currently taking prescription drugs, or are pregnant or breastfeeding. Discontinue use two weeks prior to surgery. Immune System Support is MANUFACTURED in the USA to meet FDA strict current Good Manufacturing Practice regulations (cGMP).